Extreme crochet is exactly what it says on the tin. You use yarn that is too thick and a hook that is far too big to handle. Or you use your fist. It is fast and it is furious. It is very easy to do, but needs muscle and it needs space. 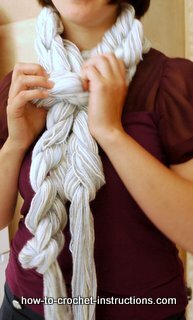 I doubt you will find a quicker way to make a scarf than this. Choose the chunkiest yarn you can find and buy lots of balls - depending how thick you want your scarf to be. If you choose a thin yarn is is doable, but prepare for the heartache of yarn entanglement. 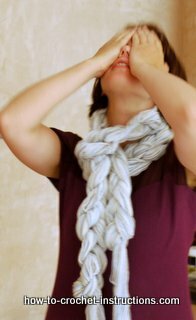 The extreme scarf in the photos was done this way and needed 60 strands of yarn. You either use 60 balls of yarn and they all get in a massive tangle or you cut the yarn to lengths and bundle them together. Sounds easy? Believe me you still get in a massive tangle. I will never make one like it again. I will however make one in chunky yarn when the above one has seen better days, because with chunky yarn it is easy peasy. You wake up in the morning. You look out of the window. You see the snow that has fallen overnight and you say "ooh ecky thump! it's snowing! I think I will need a scarf today" You make your scarf while the porridge is cooking - and off you go to work thinking you look the bees knees in your new accessory.